Long before Savannah became notorious as a Garden Of Good And Evil, it has bewitched visitors and residents alike with its gracious squares and fine old architecture; its wide cobbled streets and canopy of moss-draped trees; its slow-pace life lived on cool verandas and in brocaded parlors; a well-aged, old-world elegance. Though less widely known than its haunting beauty and fabled eccentricities, part of Savannah's enchantment is a cuisine unique in America. A blending of European, Asian, and West African foodways with the rich native produce of its environs, it has been justly, if quietly, celebrated. Part of the reason that it has been largely overlooked in our day is because it was a home-based cuisine, not found in the city’s restaurants, or in the flurry of chef-driven cookbooks that have come out of the city over the last two decades. Damon Lee Fowler has lived his entire adult life in those home kitchens, sharing with cooks, learning their secrets, and celebrating with Savannah’s chefs and home cooks a forward looking cuisine built on, and informed by, a grand, if unsung tradition. 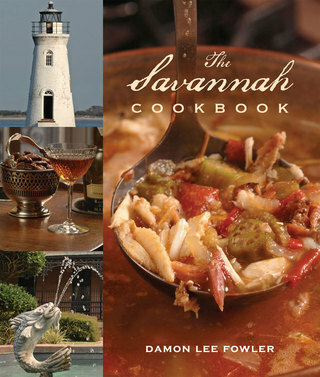 In The Savannah Cookbook, he shares the culinary secrets that have made so many midnights in this garden of good and evil memorable. Connecting the refined cookery of Leila Habersham’s legendary cooking school of the mid-nineteenth century to the cutting edge restaurants of its late twentieth century renaissance, is a simple yet diverse and elegantly spicy home cuisine rich with local seafood, where West-African, Chinese, Vietnamese, Greek, Sephardic Jews, Salzburger Lutherans, and Sicilian influences are woven into the culinary warp laid out by early English colonials.